Neo+ Beacon – An avalanche transceiver with the best range on the market that is simple to use. What more do you need? Light 240 Probe – A lightweight aluminum probe with ample length that is quick to assemble. Done. Ovo Access TS shovel – Big blade, strong telescoping handle, light and durable. Easy. 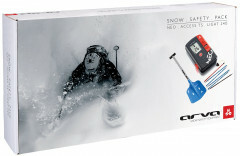 Buy this specially boxed kit, take an Avalanche class, and start practicing.